The timetable for roasting is approximately 5 to 5 1/2 minutes per pound of trimmed, ready to cook meat. Bring the roast to room temperature. (At least one hour before cooking) Preheat the oven to 500. Place the roast in a shallow roasting pan. Sprinkle with a little flour and rub the flour lightly into the fat. Season generously with salt (Lawrey’s if you wish) and coarsely cracked black pepper. Roast according to the above timetable, following the minutes exactly!!! When the cooking time ends, turn off the oven heat, BUT DO NOT OPEN THE DOOR EVEN FOR A SECOND. Allow the roast to remain in the oven for 1 hour. The roast will be beautifully rare inside and retain a crunchy outside. You need to get extra fat from the butcher to use for the Yorkshire pudding. Render the fat in a small saucepan. 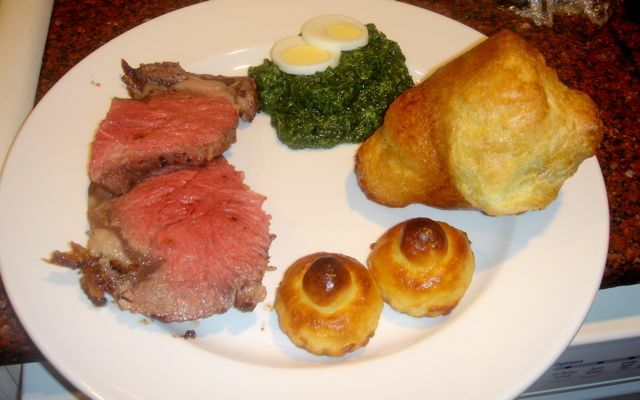 To make the Yorkshire Pudding Popovers, you need a second oven as you can’t open up the oven door where the roast beef is. Beat eggs with hand mixer until lemon colored and foamy. Add milk and stir until well blended. Do not overbeat. Add flour all at once. Hand beat until foamy and smooth on top. 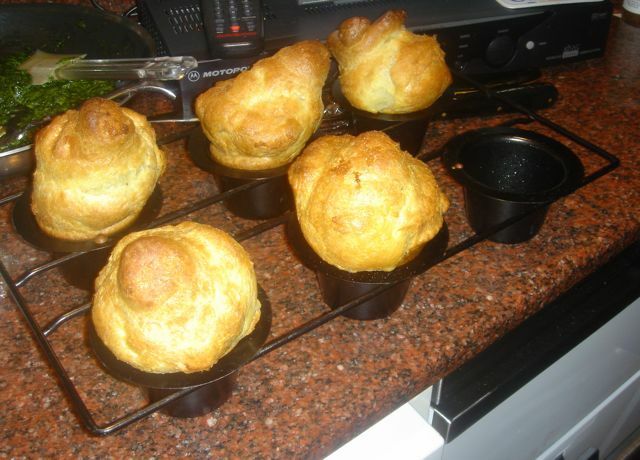 Grease popover tins with the rendered roast beef fat. Place popover pan in the oven for 2 minutes to warm. Fill cups with batter poured from pitcher, filling almost full. Bake at 450 for 15 minutes. Reduce heat to 350 and bake 30 minutes longer. 16 well-buttered miniature brioche molds measuring 2 1/2 inches across the top, chilled. I buttered with unsalted butter. Creamed Spinach – the key to good creamed spinach, whether you use fresh spinach ot frozen leaf spinach, is to wring every drop of water out of the spinach. If you don’t you will have watery spinach. Also you have to finely chop the spinach – I put it in the cuisinart, then hand chop so there are no stringy bits at all.